So what can you provide Microsoft support with that will help us expedite your AX performance case from the start? It should include things like background on whether the issue happens often, consistently, intermittently, for specific users only, etc. It’s also usually interesting to hear if the issue has been occurring for a long time, or if it has started happening recently, and if there have been any recent changes or not. If you are having problems with a specific form or process, and you have identified some X++ call stacks, please provide that information. We are also interested in your observations and ideas when it comes to a possible cause. Finally, if you have made customizations to the area you are seeing issues with, that is of course relevant, and we’d also be interested to know if you have an unusually large amount of data in the underlying tables being queried. Even if you’ve spent a lot of time putting together a very comprehensive problem description written in a Microsoft Word document, please ensure that there are a few lines in the case description in clear text that outline the main issue, rather than simply writing “see attached document”. This will allow us to more quickly route your case to an appropriate Engineer. Almost any performance issue can usually be summarized in a sentence or two, regardless of complexity, in my experience. This is part of the normal case SCOPING process we follow here at Microsoft Support. These are a must. We need to know your AX kernel build and your AX application build. We may also need more insights into individual fixes you may have installed. AX traces are usually a great source of information when it comes to troubleshooting a performance issue. 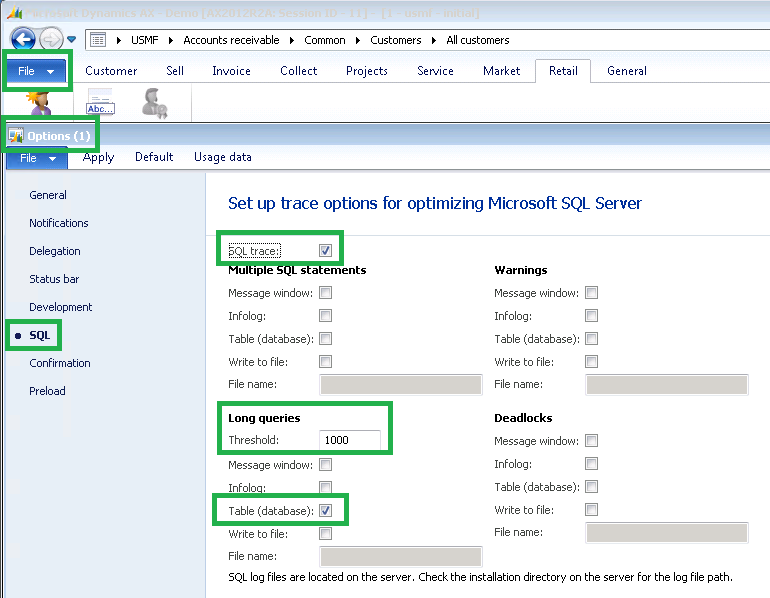 To capture AX traces on AX 2009, you use the Microsoft Dynamics AX Server Configuration Utility on the AOS and the Dynamics AX Configuration Utility on a client. When it comes to AX 2012 onwards, I prefer to use PERFMON to capture AX traces personally, as once it has been set up, all you have to do is press PLAY / STOP in PERFMON and you will get consistent data capture with minimum effort. Alternatively, you can use the Tracing Cockpit form. Installing and running Performance Analyzer for Microsoft Dynamics (DynamicsPerf) also has many benefits, and the tool can be very helpful in establishing the cause of a performance issue. If you aren’t able to capture an AX trace for some reason, you may be able to set up long query tracing and establish what X++ call stacks and SQL statements are taking time to run. I would usually suggest that you establish a reasonable threshold and log the information to a database table. Once this has been enabled, we should hopefully capture some long running queries in a table in the AX 2012 RTM / R2 / R3 database called SYSTRACETABLESQL. Once you’ve captured some data, you can run something like this to collect the top 50 slowest queries into a new table in a new database, which you can then take a backup of and send to Microsoft for further analysis. Profiler traces can also provide valuable insights, though it is important to be able to tie the SQL statements back to an X++ call stack in the majority of AX performance scenarios. A Profiler trace is usually most useful in blocking scenarios, but again, you may need an AX trace too in order to be able to tie back the information displayed in the blocked process report, for example, in order to establish what X++ has generated the blocking SQL statement. This blog post covers some of specifics when it comes to using SQL Server Profiler in blocking scenarios. The documentation that DynamicsPerf comes with covers how to set it up, as do numerous other general SQL Server blogs and walk-throughs. The DynamicsPerf tool ships with a Perfmon template that you can use to collect AOS performance counters, for example, called Server2008_AOS.xml.